On the right hand side, just click your country and fill in the details. For my Canadian readers, you are eligible! 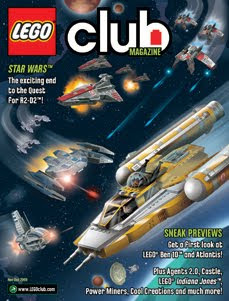 • An up-close look at the LEGO® Star WarsTM Y-Wing Starfighter! • An interview with LEGO® Indiana JonesTM set designer Hans Henrik Sidenius! • A sneak preview of LEGO Atlantis! • Action and adventure with the Power Miners! Plus Cool Creations, Pirates, Castle, Space Police and more! If you have a child 6 years or younger, there is also Lego Club Junior. Thanks for sharing this! I didn't know you could get a free sub. My son will love it! My daughter loves Lego so I know she will love this and I do too since it's FREE! Thanks for leaving a comment!